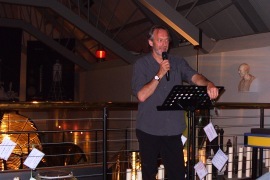 On 4 September 2010, I made my way to the Fraserburgh Lighthouse Museum for the launch of Knotbrook Taylor's (the Lighthouse's Writer in Residence) new collection, billed as ‘the world's only dedicated collection of Scottish Lighthouse poetry’. I had high hopes: let's face it, who doesn't like lighthouses? 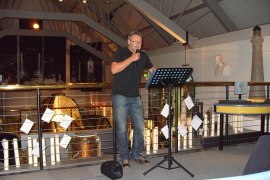 Also reading was renowned poet, John Glenday, whose work has been shortlisted for a number of prestigious awards for good reason. And if that wasn't enough to lure me in, there was the added promise of coffee and cake. I wasn't disappointed. For those of you who have not yet paid a visit to the Museum, I recommend you do so. Staff are friendly and welcoming. Guided tours are available, and it is a magical place, full of twisted, magnified and reflected light, maps and flags, brass and enamel, enticing displays and dials, all beautifully lit and laid out. It has a real air of history and lent a mystical atmosphere to the readings that followed. Knotbrook gave his usual impressive performance. The poems he selected from his attractively-covered collection were varied: the memory of a great day spent on the water with friends during a visit to the Bell Rock lighthouse (‘the strange and beautiful show’), a poem about a piece of tragic history (‘it is supposed another ship has perished’). There was humour: lighthouse no's listed some peculiar rules pertaining to lighthouses, plus, I suspect, a few additional rules thrown in by Knotbrook for good rhyme. There was, of course, a versus poem, one of a series in Knotbrook's repertoire: lighthouse v love, and I was particularly fascinated by inventory, a poem listing items which a lighthouse might contain, from a real-life list that was found. John, whose soothing, quiet voice I could listen to all day, found a reference to a lighthouse in one of his own poems, and then nicely deviated to the linked theme of the sea. My favourite was his poem about the creatures of the deep sea, The Ugly. He treated us to the uncomfortable but haunting title poem from his collection, Grain, and the beautifully written The Kelp Eaters, taken from a real account in a journal dated 1741-2, about a friendly sea creature brutally harpooned for food. Two very different voices, two very different styles, but they complimented each other, and the event was an aural treat. I came away from the event a little bit wiser, a little bit calmer, and a little bit fatter after the three cakes consumed.